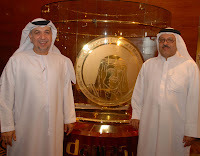 Dubai, UAE; June 01, 2009: Damas LLC, the international integrated jewellery and watch retailer, showcased the world’s largest coin-like medallion which has entered the Guinness World Record. Weighing 185.88 kg and valued at AED1 million, the gold-plated silver medallion was specially manufactured to mark the tenth anniversary of the Sheikh Hamdan Bin Rashid Al Maktoum Award for Medical Sciences. The coin is emblazoned with the image of His Highness Sheikh Hamdan Bin Rashid Al Maktoum Minister of Finance, Deputy Ruler of Dubai and the patron of the award; on one side and the Awards’ 10th Anniversary logo on the other. Presented to His Highness Sheikh Hamdan Bin Rashid Al Maktoum, the coin is one metre in diameter and 2.3 cm in thickness. The fine silver coin was crafted at the Damas factory through a complex process that involved many man-hours of work by experienced staff members. The coin initially weighed 195.2 kg before the painstaking work of engraving began. Several expert technicians worked on engraving the image of His Highness Sheikh Hamdan on the coin, which was then buffed, polished and steam-cleaned. The 22 kt gold plating work followed, and the landmark achievement was endorsed as the World’s Largest Coin-Like Medallion by a visiting team from the Guinness World Records. Operating in 18 countries with more than 500 stores, Damas has a network of retail outlets in the Middle East, India Europe, North Africa and other regions. The Group’s stores offer own branded products as well as products sold under leading global and regional luxury brands.